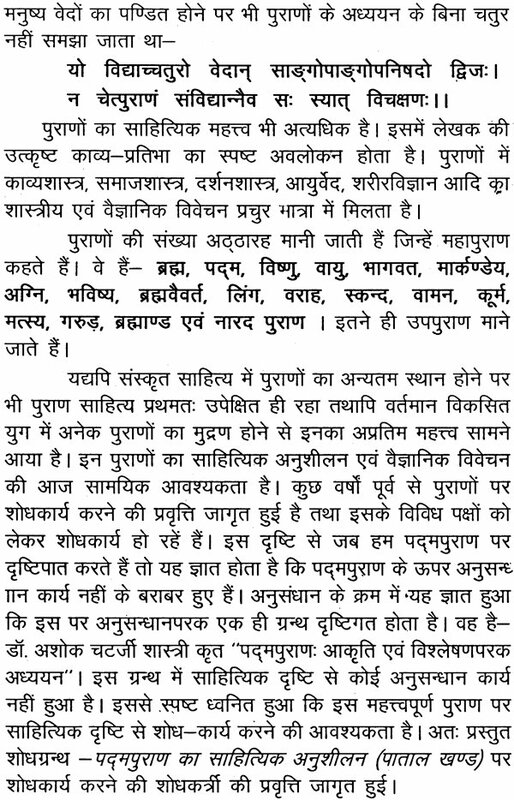 It is a great pleasure to go through the book entitled “Padma Purana (Patal Khand) Ka Sahityika Anusheelan” prepared by Dr. Sanju Mishra and write a foreword to it. The book is a well-designed research work of high order that gives a clear picture of the topic in a systematic and methodical manner. Puranas have been composed in this country at different times to present a detailed socio-cultural and socio-political back ground of the respective periods of the Country in a very simple, lucid and impressive style. 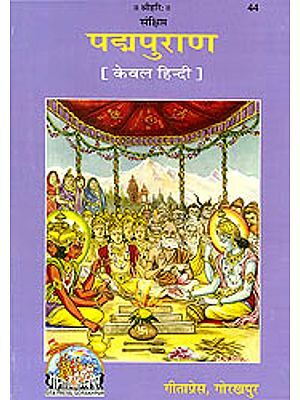 Compared to other types of literature written in Sanskrit, Puranas have become more popular among the readers and scholars due to their clarity, simplicity and lucidity of the style. As per the tradition, there are eighteen main Puranas (Mahapuranas) and another eighteen subsidiary Puranas (Upapuranas) and it is believed that all these Mahapuranas have been composed by one person i.e. Vyasa. 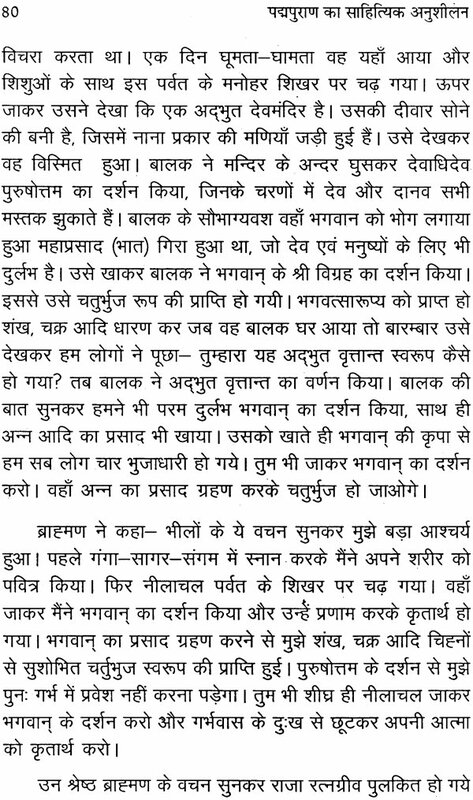 It is told that “अष्टादशपुराणानां कर्त्ता सत्यवतीसुत “. 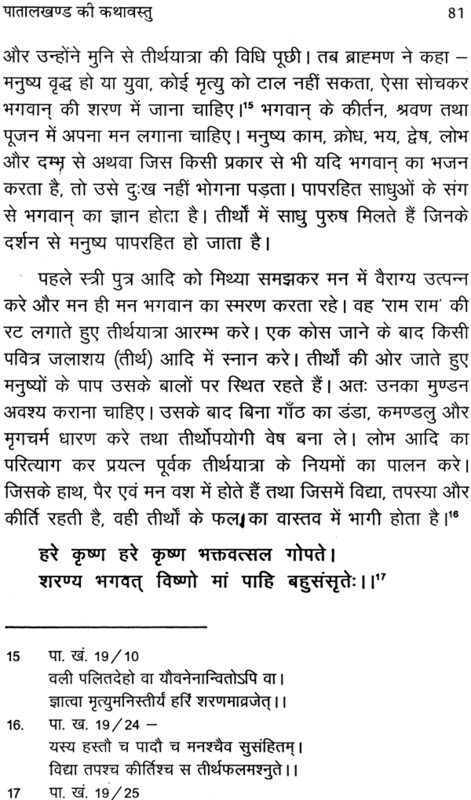 But one pertinent point has been dominating the thought process of the researchers as to whether the same Vyasa could live for so many years and compose all the eighteen Puranas at different times or this “Vyasa” was an epithet for the author of the Puranas. The historicity of the Puranas is another area of conroversy on which several scholars are still working hard to determine the historical elements in the Puranas by differentiating the same from the fictitious ones. 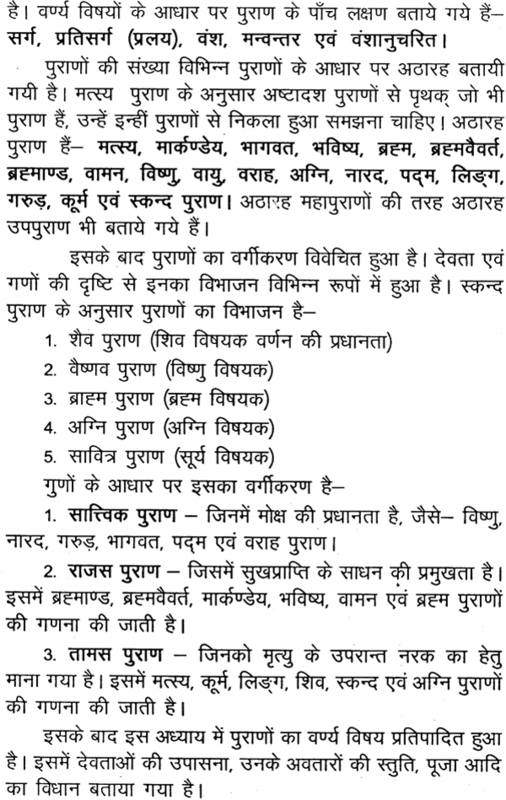 Although the Puranas deal with five principle areas like सर्ग, प्रतिसर्ग, वंश, मन्वन्तर and वंशानुचरति several Puranas describe so many other things that are very significant in the context of Indian literature and linguistics. 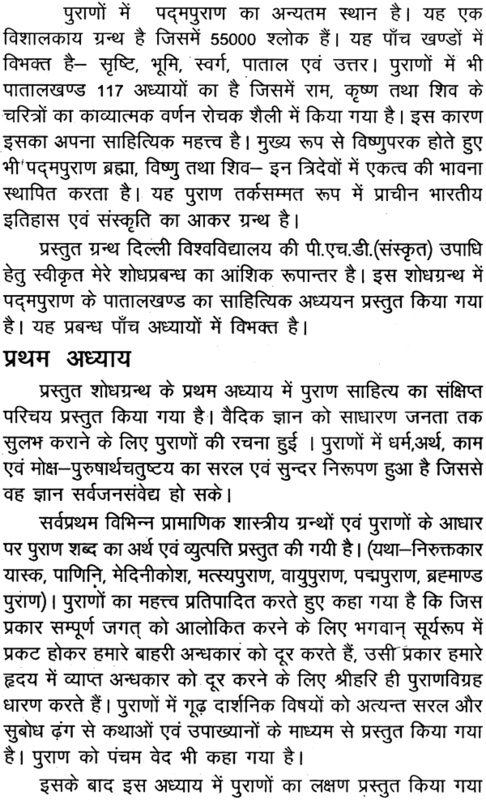 Hence, research on the Puranas is bound to be continuous process; so that the researcher can be able to find out some new areas in the Puranas after attempting to trace some convincing solutions to the above-mentioned issues pertaining to the authorship, time and underlying spirit of the Puranas. 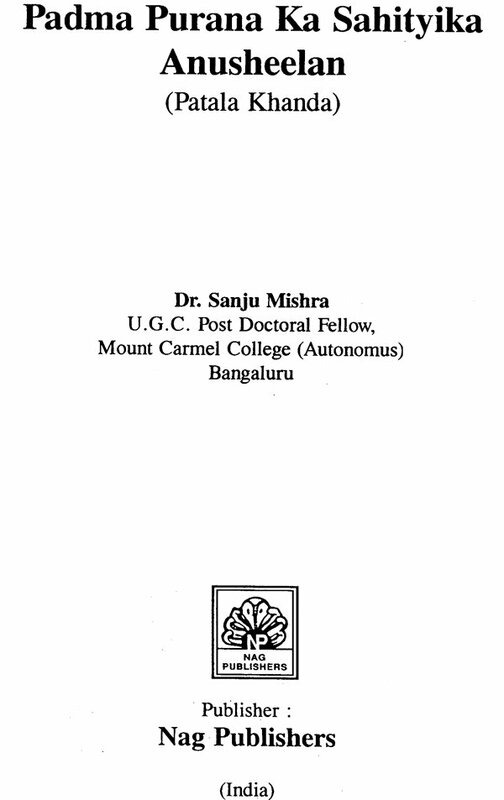 The author of the present research work accepted by the University of Delhi for Ph. D. degree deserves appreciation for selecting such an important topic for research and making successful attempts to find out suitable solutions to the problems pertaining to the topic. It is highly commendable that the scholar has concentrated on a very significant dimension of the Padma Purana, i. e. literary study on Patalakhanda of Padma Purana. While dividing the work into five chapters apart from the conclusion, the scholar has kept five important elements of literary criticism in her mind and has developed the thesis accordingly. The first chapter present a full picture of the nature and nomenclature of the Puranas and their place in Sanskrit literature in general and Padma Purana in particular. The attempts made by the scholar to determine the time of authorship and the author of Padma Purana in this chapter are highly commendable. 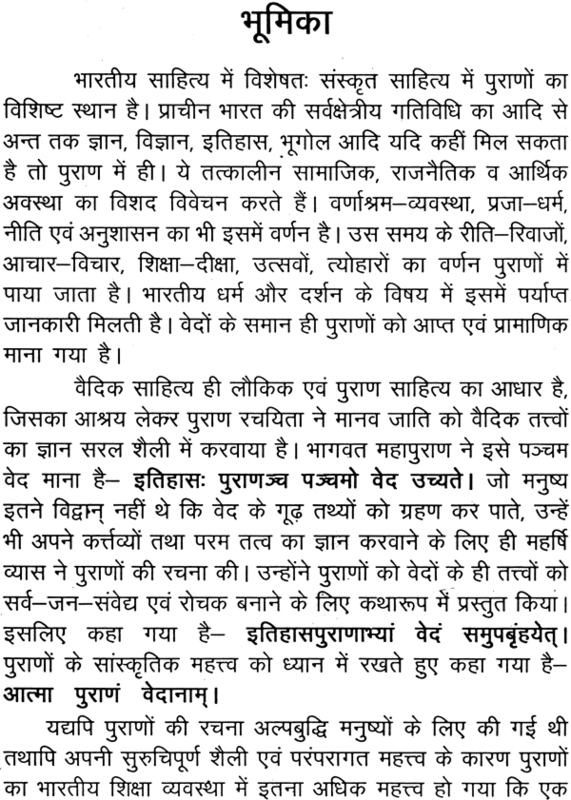 The subject-matter of Padma Purana forms the principal of this chapter. 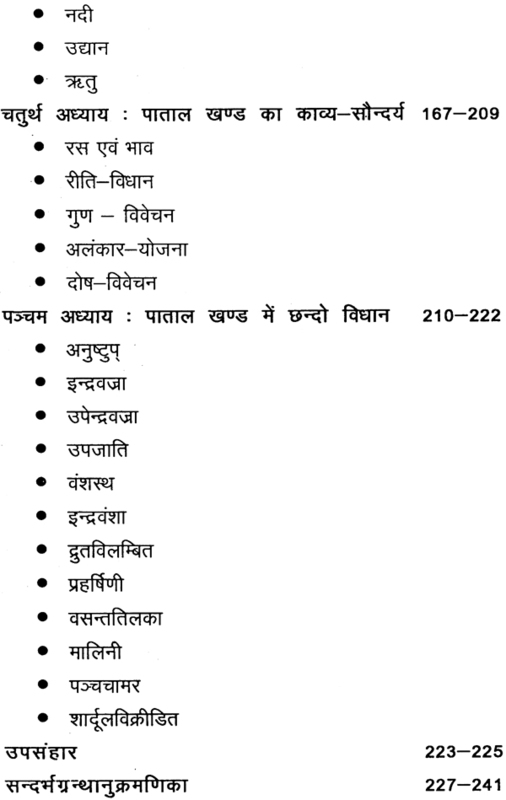 The various episodes of Patalakhanda of Padma Purana have been narrated in the second chapter. The critical analysis of these episodes as done by the scholar while presenting the theme of the Patalakhanda deserves special mention. Needless to mention that this analytical study in a reflection of the innovative outlook of the scholar in respect of reviewing a research topic. Several components and characteristic of nature have been described in a beautiful was in the third chapter. While highlighting the beauty and significance of the nature, the scholar’s aesthetic sense to perceive a thing has been clearly visible and this has led the scholar to apply the principles of Eastern Aesthetics in her presentation. The poetic excellence along with the treatment of Rasa, Guna and Alankara has found place in fourth chapter, that forms the main part of the dissertation. The Micro-analysis of the Slokas of Padma Purana in the light of the parameters of Indian literary criticism is a glaring, instance of the original research, the scholar has intended to conduct. 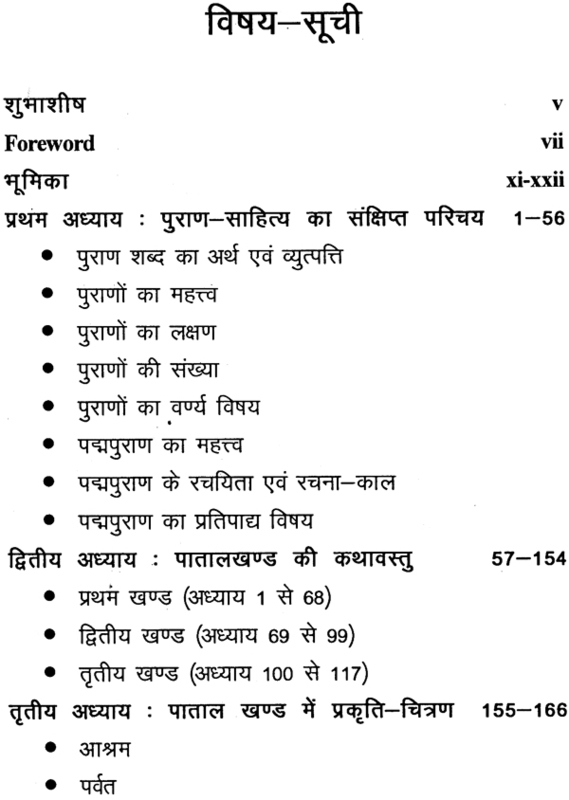 Various metres used in the concerned part of Padam Purana have been projected in chapter five and while doing so, the scholar has extensively referred to the principles of prosody. The finding of the entire intellectual exercise have been mentioned in the conclusion; which is extremely significant from the research point of view. The Bibliography appended to the dissertation containing the titles of the number of books referred by the scholar for preparing the thesis is an indicator of the deep and wide study and consultation of the scholar that has helped her in arriving at reliable conclusions. The exhibition of the research aptitude, hard work and devotion to work of the work of the scholar in preparing the thesis is noteworthy. On the whole, the present dissertation is a complete exposition of the research topic chosen by the scholar and the work is a useful contribution to the field of knowledge in the relevant field. While congratulating the author for her outstanding work, I am confident that the book will be well-received by the scholars and researches for its innovative approach to this field of knowledge. Though the Almighty bless her; so that she could produce many more works of high standard in future to enrich the world of Sanskrit Literature and Indian Culture. I wish this publication a grand success.